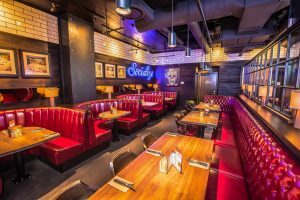 Posted November 25, 2016 by Norburn Lighting and Bath Centre & filed under Commercial Lighting, Featured Projects . 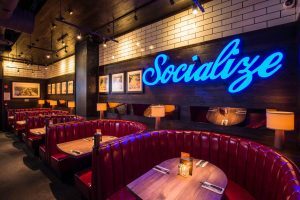 Browns Socialhouse exudes an inviting and casual dining experience that is reminiscent of a classic diner refined with an industrial modern twist. 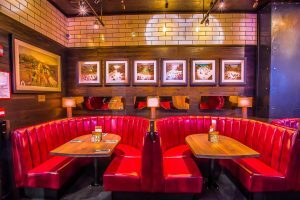 Comfortable red booths give the restaurant a classic diners feel, while the exposed bulbs, ceilings, and wood tables provide an industrial feel to the space. 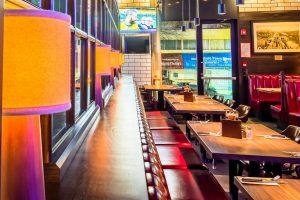 The lighting uses clean silhouettes that provide a modern touch, and pulls together the entire look. 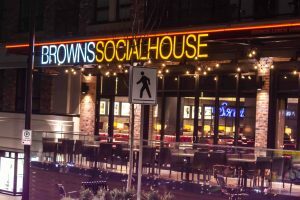 Enjoy great food with great company at Browns Socialhouse located on 103 2nd Street W.
For commercial lighting inquiries, contact our showroom at 604-299-0666. Posted November 18, 2016 by Norburn Lighting and Bath Centre & filed under Bathroom Lighting, Contemporary Lighting, Decorative Lighting Fixtures, Hinkley, LED, New Products, Pendant Lighting, Trends . 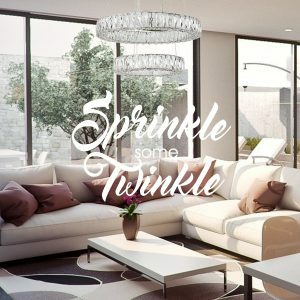 Sprinkle some Twinkle showcases lighting that adds a touch of twinkle into any room with the use of metallic or reflective finishes, crystals, textured glass, and more. 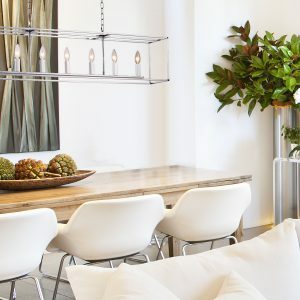 Fixtures with metallic finishes are great for adding a subtle sparkle to a room. The Modern Elegance Chrome Chandelier from Artcraft is a beautiful rectangular open concept fixture that highlights exposed bulbs encased in square candle holders. This chandelier adds elegance over a long dining table. 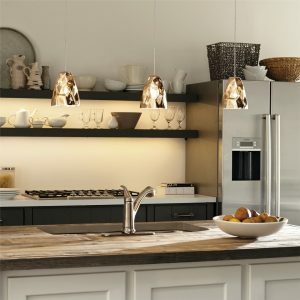 The Mini-Zuri pendant from LBL Lighting has a copper finish and a bent metal appearance. 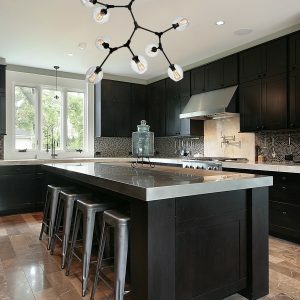 This pendant not only adds shine, but also adds a layer of texture for visual interest. The Facette Grande by LBL Lighting is a stunning pendant made of triangular facets. The upper portion of the pendant is made of texturized paint while the bottom is made of smoked glass. 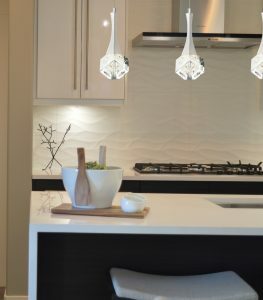 When the pendant is lit, the smoke glass facets create a beautiful shine. 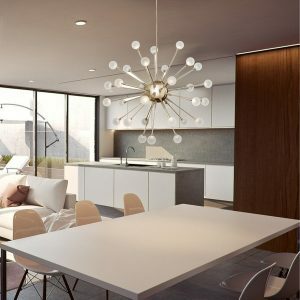 The Loop pendant from Eurofase is finished in chrome and has a clear glass shade with textured detailing to refract light producing a sparkle effect. Sprinkle some Twinkle would not be complete without crystal fixtures! Crystal fixtures create a glamorous and luxury feel to just about any space. 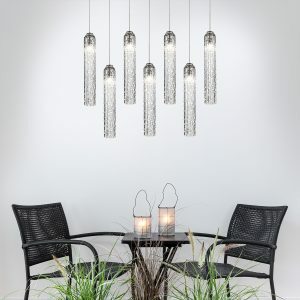 The Rockne pendant from Elan uses K9 crystals and is finished in chrome. The chrome is kept sleek to keep the focus on the crystal gems. Valla from Quoizel is a breathtaking pendant with crystals that delicately line the chrome framing. 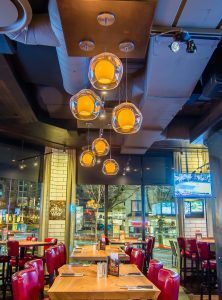 Fixtures that have a sporadic or spherical structure figuratively capture the essence of twinkle. 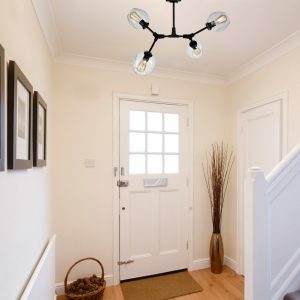 The Impulse by Hinkley has a Sputnik design and has a polished gold finish for added sparkle, while the opal glass helps defuse the light. The Bel Air from Artcraft has curls of chrome that appear like decorative ribbons. 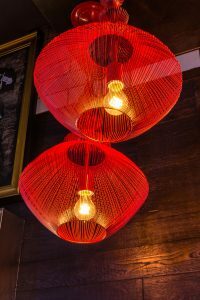 Posted November 10, 2016 by Norburn Lighting and Bath Centre & filed under Decorative Lighting Fixtures, Kitchen Lighting, New Products, Trends, Uncategorized . 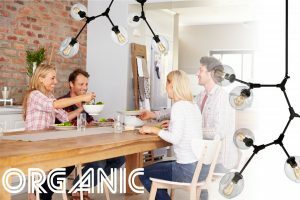 New to our showroom is the Organic Collection by Artcraft, available as a 4 light semi-flush and as an 8 light chandelier. The collection is reminiscent of a molecular architecture with dark metal framework, and dimpled clear glass to feature exposed bulbs. 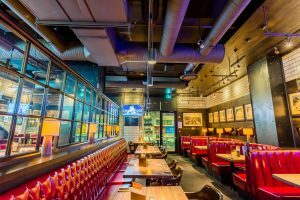 The metal arms are adjustable allowing for flexibility in style, and comes with a hangstraight and additional rods to accommodate sloped ceilings, and different ceiling heights. 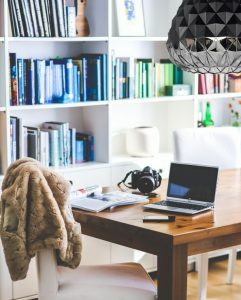 This collection is a great way to integrate a bit of personality into any space! 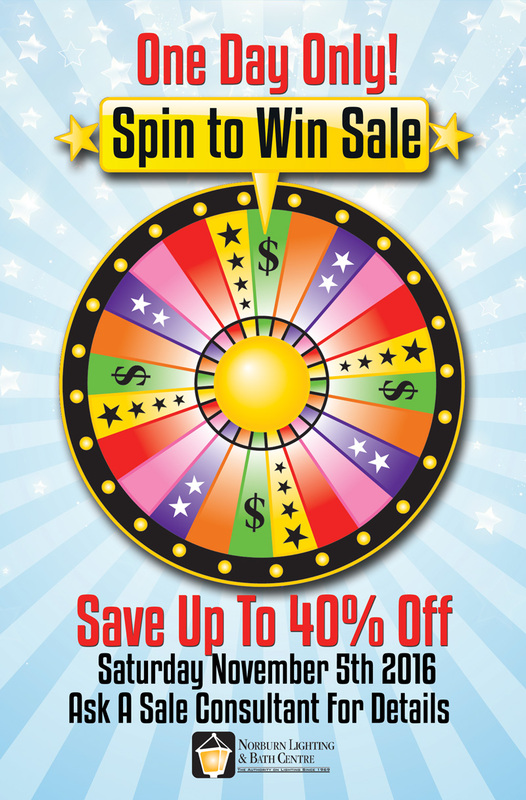 Posted November 3, 2016 by Norburn Lighting and Bath Centre & filed under Sales and Promotions .